“With considerably more flamboyance than the situation demanded, their unexpected rescuer thrust his pistols back into his waistband, adjusted a filthy dirty cravat at his neck, cocked his leg over the branch he was sitting on and slid to the ground. 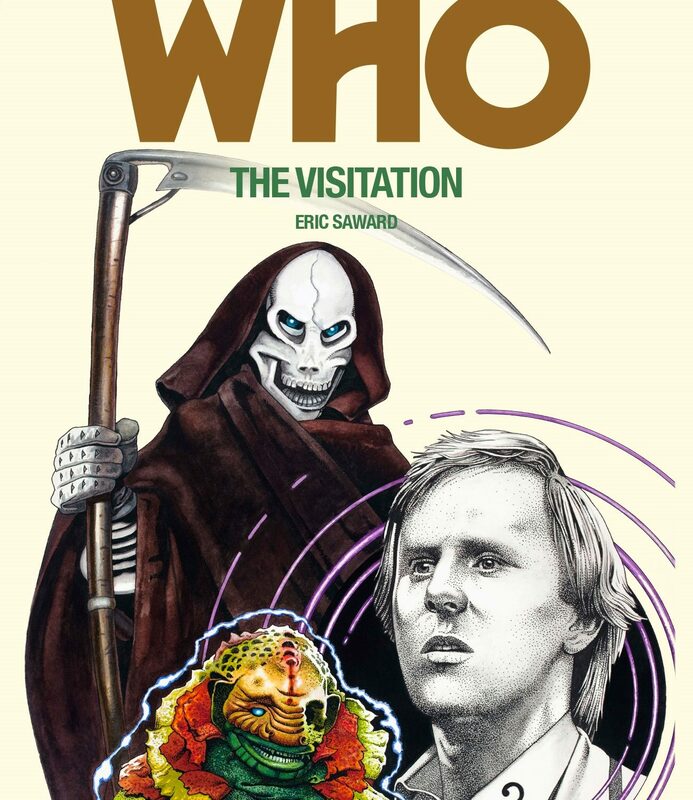 It should come as no great surprise that Eric Saward’s novelisation of The Visitation begins with a ritual massacre. When it comes to multiple deaths, the man has form. Admittedly he usually leaves it until the end of the story, but it’s something we came to expect, like jokes about the Doctor’s eyebrows, the swish of a screwdriver, or the oft-repeated “Doctor Who?”. That’s veering off the point, but when Steven Moffat famously said (of 2012’s The Angels Take Manhattan) “Not everyone gets out alive, and I mean it this time” you could almost hear Saward laughing. 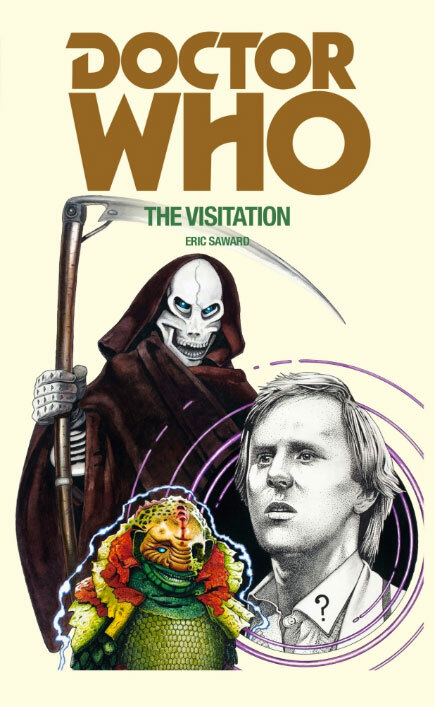 Both within the canon and the Fifth Doctor’s run generally, The Visitation is rather overlooked. It’s a slight, inconsequential story, more famous for the destruction of the sonic screwdriver (“I feel,” the Doctor protests, somewhat put out, “as though you’ve just killed an old friend”) than for anything else – its fiery conclusion aside, of course, but we’ll get to that. The Terileptils (anagram of ‘Lit Reptile’, which is presumably deliberate) are the worst sort of would-be colonists, mundane rather than menacing, forgettable rather than frightening. Really this is an excuse for a frolic in the woods – and it must be said that, by and large, it’s not really a bad one. But it seems a strange choice for a reissue, particularly when you take a look at the cover. 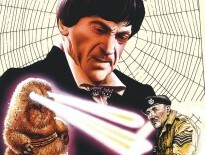 Davison, of course, was famously reluctant to allow drawings of himself on the Target covers – something that the re-released range has seen fit to correct. 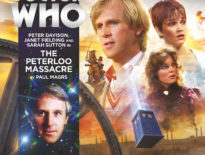 The smiling, youthful Fifth Doctor that adorned the previous version has been replaced by a bloke with a distinctly wonky nose. At least the android looks suitably menacing, even if the grinning Terileptil resembles a heavily disfigured Danny DeVito. Curiously a part of the aforementioned opening chapter is narrated from the point of view of a patrolling fox, which is one of the few stylistic innovations of an otherwise bare bones adaptation. This is a hundred-page book that gets in, tells its story and then gets straight out again. Saward avoids the unnecessary descriptive prose that hampers many of the Past Doctor Adventures (Eye of Heaven, I’m looking at you) but it’s difficult not to feel a slight disappointment that by the end of the story we know little more about Richard Mace than when we came in, particularly when his departure – as is so often the case with Classic Who – is so startlingly abrupt. Mace aside, the general lack of supporting cast – beyond hostile, pitchfork-wielding villagers and sinister aliens – allows a lot of room for the main characters. Tegan and Adric, for instance, have a couple of lovely scenes together, with the young man showing an unexpectedly tender side when comforting the bolshy Australian. Adric, indeed, spends most of the story either running to or from the TARDIS, in various stages of capture or release. At one point he twists an ankle, which would have made Terry Nation proud. Saward clearly struggled as much as any other writer with finding things for the characters to do, which is why he sends Nyssa to her room to build something that the Doctor could have probably done without had this been a story that took place after Earthshock. As it is, The Visitation suffers in much the same way that Four To Doomsday does: there are too many cooks in danger of spoiling the posset. Even if his descriptive prose is seldom elevated above the purely functional, Saward retains a flair for dialogue. Asked how she is feeling, a de-hypnotised Tegan replies “Groggy, sore and bad-tempered”, causing the Doctor to quip “Almost your old self”. Indeed, the Doctor seems to spend most of the story seemingly one step ahead of the others – not in an omniscient, manipulative Seventh Doctor kind of way, but with a sense of inevitability that borders on the zen-like. Even when captured, his calm demeanour never evaporates: his reaction, on emptying his pockets of various unhelpful odds and ends, is “I really must get a proper survival kit together”. There are moments that jar. Mace’s proclamation that the android looks like “Death, the Great Reaper” is somewhat undermined by the fact that Saward has just described it in precisely the same way – so, too, many historians are likely to take issue with the description of Restoration era London as a ‘medieval city’, but perhaps this is nitpicking. Certain cosmetic details that we glance over within the show gain new significance when Saward points them out. Why are Nyssa and Tegan sharing a room, for example, given the size of the TARDIS? What did they do in there? Did Nyssa complain about Tegan’s piles of dirty laundry while Tegan swore every time she stepped on another component from one of Nyssa’s electronics experiments? Did Adric drill a small spy hole so he could watch them getting undressed? When Tegan saw the devastation wreaked by the android, did she respond with “NYSSA? WHAT DID YOU DO TO MY ROOM?! ?”, while Nyssa gasped at the camera and put her hands on her cheeks? 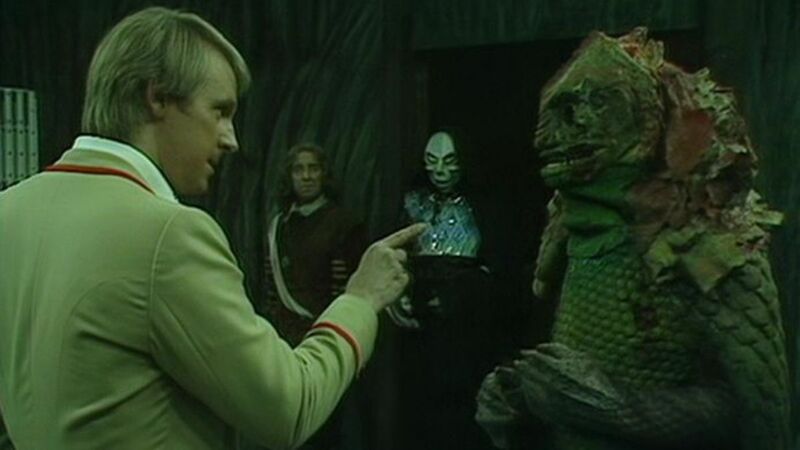 On the other hand, Saward’s description of the Terileptil commander is strikingly vivid. “His head was not unlike that of a Tyrannosaurus Rex,” he writes, “only smaller and with a shorter snout. But any thought of the head containing a dinosaur’s peasize brain would have been dispelled by one glimpse of the lively, intelligent, magenta eyes. Instead of hair, the crown of the head was covered with tiny, flat orange fins, which continued down the back of his neck, where they grew thicker, swelling out where they met the finely scaled epidermis like a ruff.” It’s a shame there isn’t more like this, and less of the sparseness that describes – for example – Tegan and Nyssa’s bedroom, with its “mixture of Art Deco and Victorian furnishings”. I’m all for allowing the imagination room to manoeuvre, but there are times when it feels like you’re reading a transcript. But perhaps that doesn’t matter too much. Saward may not have chosen to maximise his allocated page count, but he knows how to keep up the pace and tell a story, even if much of it is a simple fetch-and-carry. That he leaves seventeenth-century society – with its foibles and quirks – relatively untouched is not to the detriment of the narrative, and if the book finishes abruptly, it does nothing but mirror its on-screen counterpart. As the Doctor and his companions leave the fire in Pudding Lane to ‘run its course’, we realise that as much as anything else, the entire story has been building up to this moment – almost as if it were the punch line to some colossal joke. But it’s a joke that works. In the end, it’s all in the way you tell them.